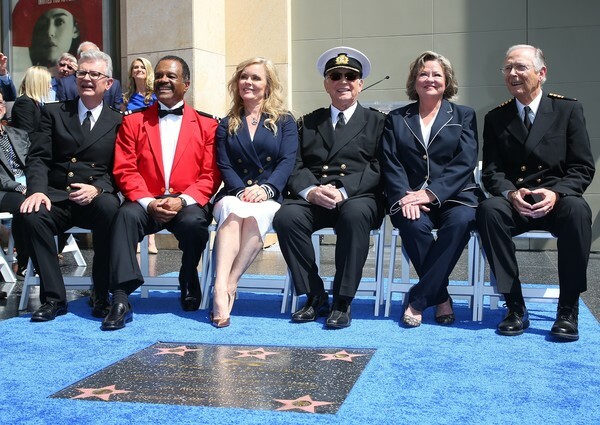 Princess Cruises and the original cast of “The Love Boat” were presented with a Hollywood Walk of Fame honorary star plaque today, in recognition of their contributions to the history of television. Gavin MacLeod (Captain Stubing), Jill Whelan (Vicki), Ted Lange (Isaac), Bernie Kopell (Doc), Lauren Tewes (Julie), and Fred Grandy (Gopher) were joined by Leron Gubler, CEO of the Hollywood Chamber of Commerce, Donelle Dadigan, co-chair of the Hollywood Historic Trust, the superintendent of the world-famous walk and Jan Swartz, President of Princess Cruises. The plaque is located on Hollywood Boulevard in front of the main entrance to the Dolby Theater. “The Love Boat” premiered in May 1977 with some of Hollywood’s biggest stars and set aboard a cruise ship. After the pilot show, “The Love Boat” went on to enjoy substantial success, continuing for ten seasons until 1987 as one of the highest-rated, prime-time television shows in the nation. Princess Cruises’ Pacific and Island Princess were the two original ships in the series, but as it grew in popularity, the show was filmed aboard many Princess ships around the world.